Hang on to your hat! 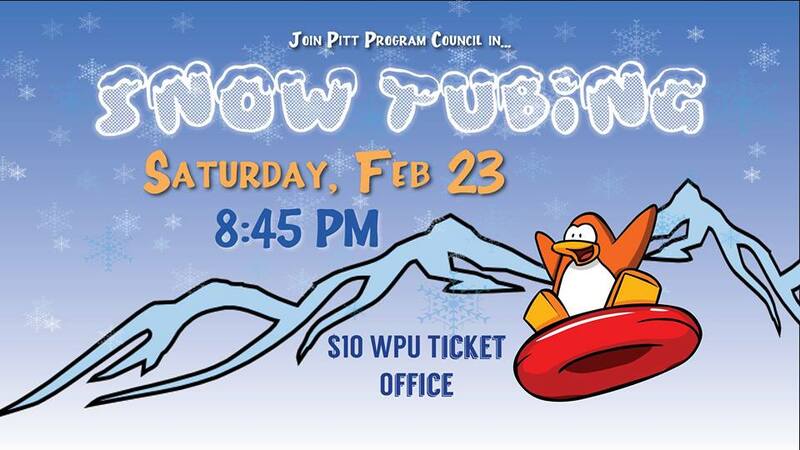 Enjoy the winter weather with Pitt Program Council in Snow Tubing, where students will enjoy a 2-hour private snow tubing session at Seven Springs Resort! Seven Springs’ snow tubing park, the largest snow tubing park in the region, is “snow much fun” for everyone! Tuck yourself into a tube, grab onto the handles and feel the cold crisp air on your cheeks as gravity sends you plunging down one of their 11 chutes. Don’t worry about gasping for air. Snow tubers are whisked back up the hill via one of the Magic Carpets. Tickets go on sale Monday, January 28, 2019 in the WPU ticket office and are $10. Limit: 2 tickets per person – both must be Pitt Oakland undergraduate students. Sold as a complete trip only.